The food is commonly prepared from immature grains of durum wheat when the grains are still milky. The stage at which farīk is prepared is very critical. The moment the leaves start to turn yellow and the seeds are still soft and creamy is the ideal moment. The wheat is harvested and arranged in small piles and left to dry in the sun for a day. The piles are set on fire and the blaze carefully controlled so only the straw and chaff burn and not the seeds. It is the high moisture content of the seeds�unique to hard wheat�which prevents them from catching fire. The supervisor of the burn must pay close attention to the location of the fire, the wind, and the progress of the burn to assure a perfect final product. The roasted wheat then undergoes further thrashing and sun-drying to make the flavor, texture, and color uniform. 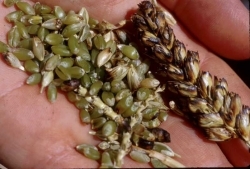 It is this thrashing or rubbing process of the grains that gives this food its name, farīk, or �rubbed.� The seeds are now cracked into smaller pieces so they look like a green bulgur. The resulting food is earthy, smoky, and has a distinct flavor. It is popular in Syria, Palestine, and Jordan and one finds famous freekeh dishes in Turkey, Egypt, Tunisia, and Algeria. Freekeh has a higher nutritive value than rice, especially in protein, vitamins, and minerals. The making of a dish called farīk is quite old as we know from the early thirteenth-century Baghdad cookery book whose recipe called farīkiyya was described, although we can�t be sure this was made from green wheat let alone durum wheat. In that recipe meat is fried in oil and braised with water, salt, and cinnamon bark. Then dried coriander is stirred in with young wheat and it is cooked until done and served with cumin, cinnamon, and fresh lamb tail fat. In Tunisia, farīk also refers to young barley grains and is the name of a kind of almond that will split into two with only the slightest rubbing pressure. Another North African dish called farīkiyya (ﻔﺭﻴﻛﻳﮥ) is a kind of harīsa (the porridge, not the spicy condiment) made with green wheat instead of the regular hard wheat. Farīqiya (ﻔﺭﻴﻗﻳﮥ) is a gruel made with dates or rice and milk fed to women giving birth. Farīk is found in the U.S. mostly in Middle Eastern markets and, to a much lesser extent, natural food stores. To clean the farīk before using spread the grains on a baking sheet and pick out any stones or chaff . Place in a strainer and give it a rinse under running water. You can find out more, as well as purchase, freekeh on-line at Freekehlicious and see interesting photographs of its production here. Famous Middle Eastern or North African dishes made with green wheat are ḥamām bi�l-farīk, a pigeon stuffed with green wheat from Egypt; firik pilavı, a green wheat pilaf from Turkey; shūrbat farīk bi�l-mukh, a green wheat and bone marrow soup from Tunisia seasoned with chiles and vegetables and chickpeas; farīkat laḥma, a green wheat pilaf dish with roasted lamb, spring peas, and pine nuts from Syria; and shūrba al-farīk, a Palestinian soup with green wheat and chicken.